Three Minute Tips #5 – Semi Stand Development. So every now and again I’ll purchase a new camera and inside there is a roll of film – sometimes with just a few frames shot, sometimes almost finished and I’ll always finish off the roll and attempt to develop them. The roll that was in the Diana was a roll of Boots branded black and white film that even had a few frames left. I didn’t even know that Boots ever made roll film and my attempts to contact them about it failed. So anyway, this is supposed to be a three minute tip – sorry I forgot. The best way I have found to cope with these old films, or unknown films, is a semi stand development process. With regular black and white development your film is submerged in a solution of developer for between 5 and 10 minutes on average, and you agitate it in the solution once a minute or so. This all varies between films and developers. Usually you’ll mix up your developer to a ratio of something like 1:25 (developer:water) but with a semi stand I tend to do 1:100. This creates a much weaker solution so therefore the film needs to be in it longer – about 90 minutes I have personally found best so far. The film out of the Diana, at the time of me processing it, I had absolutely no idea how old it was. The Diana was brought to market in the 1960, so the film couldn’t have been shot before that (although technically it could have already been an old film before it was put in the camera…), and much internet research could not get me any information whatsoever about Boots ever selling their own branded 120 roll film – so it couldn’t be very recent either. With early old film – this one could in theory have been 50 odd years old – I really worry that too much agitation is going to cause parts of, or all of the emulsion to lift away from the base of the film. I believe that stand developing with minimal agitation will minimise this risk. The other issue aside from the age was that being able to find any info on the film also meant that I had no developing times for it. Again, stand developing seems to circumnavigate this issue, as I have developed several different emulsions in the same mixture and technique with success. I use Rodinal R09 at a ratio of 1:100 and leave it for 90 minutes. Every half an hour I will give a small agitation with the spinner on the top of the tank. I don’t do a full inversion – I don’t want all that liquid sloshing around in the tank and running the risk of possibly lifting the old emulsion. …and thats it. To conclude – weak developer, longer time, unknown film, old film. Again I hope this post has been of use to somebody. …and by the way, looking at the clothes 1960s…? Author Neil PiperPosted on February 9, 2018 February 9, 2018 Categories Developing, Film, photographyTags 120, analog, analogue, black&white, blog, boots, developing, diana, diana camera, film, neilpiper, photography, rodinal, semi stand develop, threeminutetipsLeave a comment on Three Minute Tips #5 – Semi Stand Development. If you’re developing your own black and white film at home in your sink you’ll know that you need to wash your film under running water that is approximately the same temperature as your chemicals. If you don’t have a mixer tap, a great alternative is one of those push on / pull off shower head attachments that you can buy for your bath taps. One end goes on the cold tap, one on the hot, cut the shower head off and hey presto you have one of those force film washers for less than a fiver. There are a few apps available that allow you to preview your film negative as a positive. A quicker way that I have been using for a long time to do it is to invert the colours on my smart phone. Im sure most smartphones can do this but i have an iPhone 6s and I know how to do this on iOS. Settings, General, Accessibility, Display Accommodations. At the top of the list you will see ‘Invert Colours.’ Click on this and toggle ‘Classic Invert. It inverts all the colours over the whole of the operating system – including the camera. When you then hold your camera up to a film negative, preferably on a light box you will see on screen the positive version. …but thats not quick you say…!? Well no, thats not, but if you go again to your Accessibility settings, scroll right to the bottom and go to the Accessibility Shortcut tab you can set this up as a shortcut from the iPhones home button. Three clicks of the button from any screen and the screen will invert. Three clicks again and its back to normal. Its no alternative for a scan, but helpful for quick reference. Back in April I was at my local car boot sale scavenging for cameras when I came across an original Diana camera. It was in its original box with one of the previous owners name and address written on the bottom and even had the instructions with it. The only thing it was missing was a lens cap, but having never really been interested in the Diana range of cameras I didn’t know at the time that it was supposed to have one. And I probably wouldn’t have cared – I certainly don’t now. The chap was also selling something calling itself a ‘Vista Colour Camera,’ and bundled the pair together after some haggling for the princely sum of just £8. £4 for an original Diana in its box isn’t to be sniffed at. £4 for a boxed Vista Colour Camera…? Well I’m not sure about that one. I’ll talk more about that monstrosity another day because its now fast approaching July and I’ve still not really tried it out. Plastic lens – Check. Ability to focus – Check. Well sort of. 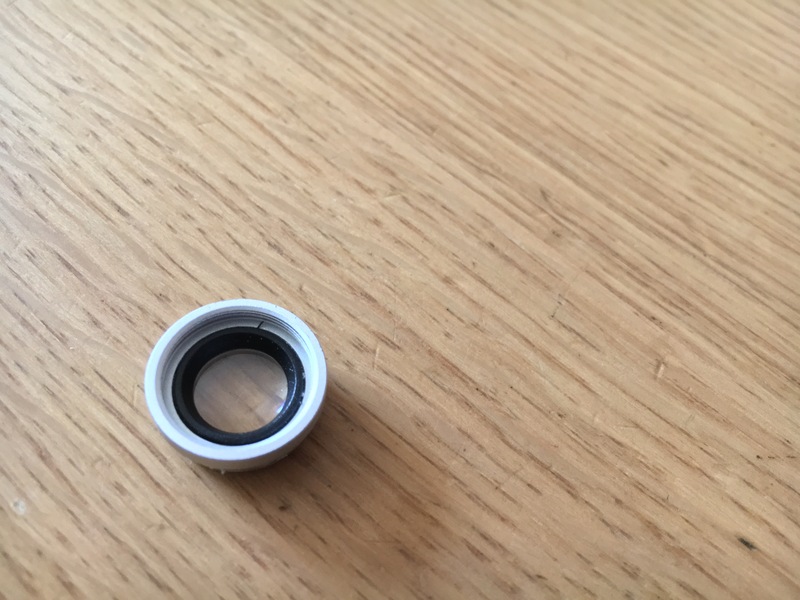 You’ve got a basic focusing ring that screws the lens towards and away from the film plane. Options for 4 – 6ft, 6 – 12ft and 12ft – Infinity are marked on the front of the lens barrel but in the couple of rolls of film I’ve put through the Diana none of these have seemed to make the slightest bit of difference. I think that the blue top plate looks fantastic. In the sun it’s a cool baby blue. Right now under a light in the kitchen its kind of grey with a blue hue to it. The graphic design work on the stickers on top are a work of art, and leave you in no doubt which type of film to stick in there…! Oh and turn that film advance and listen to the wondrous noise that comes out of it. Its like a kids bicycle when the spokes are covered in those clicked clacker things. It’s awesome really. Mounted in this top plate is a big bright viewfinder so you can see what you’re pointing it at. Although it’s not coupled to the lens and has no parallax correction markings so if yore attempting to shoot something vaguely close up be prepared to compensate for this. It has three aperture settings (and I use that term loosely) that are simply marked with the standard recognisable ‘Cloud’, ‘Sun/Cloud’ and ‘Sun’ symbols. These apertures are not formed by blades how you may be familiar with in a modern lens, rather simply just a plate that moves behind the lens when actuated by the selector switch underneath. This plate has two different sized holes (apertures) in it, which correlate to the Sun/Cloud and Sun settings, and for the Cloud setting the plate moves aside. Just make sure when you’re changing your settings that the aperture in the plate sits central as it has a habit of not centring itself. The shutter release button isn’t really a button, more of a lever. Move from top to bottom and the bottom of the stroke is when the shutter is released. There is no lock to prevent you making multiple exposures, but I guess that that is part of the charm of a Diana. No tripod attachment thread. Although nobody has probably ever needed one I struggle to think why the Great Wall Camera Company or whatever they were called thought people would like a bulb setting on their camera but no real way of steadying the camera other than the old ‘sit it on a wall or similar’ technique. So what do the images that it takes look like? You know exactly what they look like…Square, 4x4cm (ish) frames with massive vignettes and with focus that drops of enormously at the edges of the frame. But that doesn’t matter because chances are the centre of the image isn’t going to be razor sharp. Or even just sharp sharp. It’s going to be soft. Soft as a soft-boiled egg. But no really even if you actually used the focusing scale on the lens it’s hit and miss as to what you’re gonna get out of it. And even then you’re beautiful image is going to have an enormous light leak smeared across it. But you already knew all of this. That’s why you wanted a Diana in the first place. Be it one of the new variants from Lomography or an original one like this one. Oh yeah. And the strap is too short for a fat man. Are You an APS Shooter…? 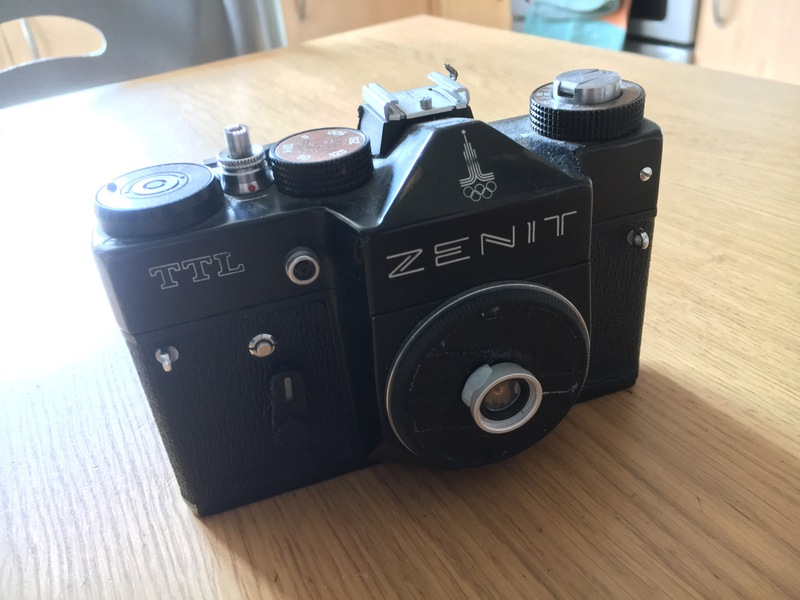 It’s certainly no Trip, But cosmetically it looks like it’s barely been used which is good, and it does appear to have a part shot film in it which is always fun. It’s takes a CR123A battery like the Olympus Mju as well so I swapped one into it and it fired up a treat. It’s got a 30-60mm zoom lens so nothing special there, and comes equipped with the standard run down of flash settings. A chunky little late 1990s beast in that classic ‘1990s space age brushed crappy grey and black’ finish. Even has a tripod mount which I’ve always found a must have for small point and shoot cameras…! I’ve been after something that takes APS for a while now. A pal of mine on instagram (yes you @londoncameraproject) is forever harping on about APS and how it’s a forgotten gem of a format. I’ve personally never shot it and personally can’t see why it was really ever a thing…but, I now have the F600 and a stack of APS in the fridge I’m going to give it a go once I’ve worked out a satisfactory bodge for developing and scanning it. I know that there are labs around that advertise dev of this format but I’d really like to work out a way of doing it at home. The main issue that I think I’ll face, other that the actual dimensions of the film are that APS isn’t supposed to be released from the cartridge. Well maybe it is for development but certainly afterwards it goes back in the cartridge to keep if clean and safe. I need to hack an old cartridge open really and have a gander at how it works. Anyway because of this feature you can’t open the camera until the film is wound back, the F600 has a lever on the side to open it and I assumed it was jammed…but a quick look at the manual online (available at https://www.manualslib.com/manual/89133/Kodak-Advantix-F600zoom.html?page=16#manual incidently) showed me my error. Author Neil PiperPosted on June 12, 2017 June 27, 2017 Categories UncategorizedTags analog, analogue, APS, blog, film, kodak, photography, reviewLeave a comment on Are You an APS Shooter…?